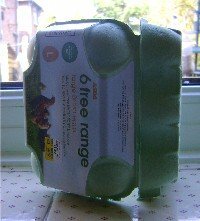 Looking For Egg Carton Crafts - Try This Seed Propagator. Egg Carton Crafts are great fun for kids. This propagator costs only the price of a packet of seeds. If you are really prepared you may even have seeds you saved from last years plants and then it will cost you nothing! 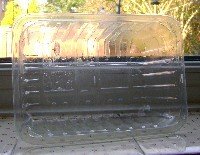 Also one less real propagator tray manufactured is much better for the planet. The egg carton is perfect for the job as seed tray. You can put it on the widow sill on a tray with the lid on. Or if you don't have tray put it on a wad of newspaper like I have. Once your seedlings are ready to plant out you can just pull the egg carton apart and pant that with them. No need to prick out. 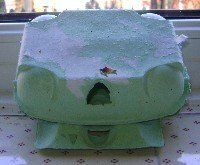 So get the kids recycling and enjoy this egg carton craft. This is a plastic tray that had some sort of meat joint in it. It's exactly the same as a propagator lid you can buy in the shops. Other food products come in this type of container and shapes and sizes will vary. Use the best fit you can for your egg carton. Any cardboard egg box will do. If it has a shiny label you will need to rip that off or you won't be able to plant the bits of the box with the seedlings. 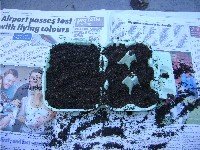 Take your egg carton out into the garden put it onto some newspaper and fill it with soil. Take it in and put it on the window sill with either a tray or some newspaper underneath it. 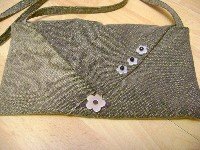 Sew some seeds thinly and cover with another layer of soil. Water your seeds once a day. 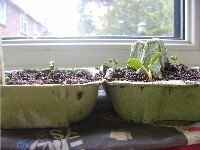 The egg carton will absorb some water and keep the soil moist without being too wet. If you are using a tray to stand your carton on make sure that it isn't full of excess water. Pop on the lid, sit back and wait for the seeds to grow! If you like this craft sign up for our monthly newsletter. 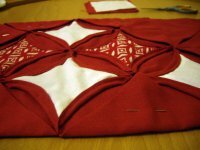 It will keep you up to date with new crafts and ideas on this site.